On June 25, 1993, a Game Boy game titled Baby T-Rex was released to little or no fanfare. Five months later, We’re Back came out for the Game Boy, with similar results. By the year’s end, two more titles, Bamse and Agro Soar, hit shelves, neither of them receiving much attention. 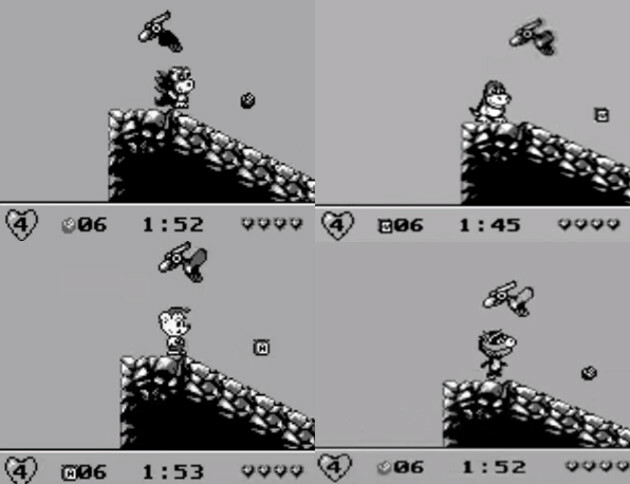 Although there are plenty of forgettable titles in the Game Boy’s library, the circumstances surrounding these games is slightly unusual: Every one of them is the exact same game. In the 80s and early 90s, it wasn’t particularly unusual for a game to be re-purposed. Yo! Noid was a re-skinned version of a Famicom game called Kamen no Ninja Hanamaru. Sports-A-Roni, a Commodore 64 title, was ported to the Famicom as a Donald Duck title, and was released again for the NES as Snoopy’s Silly Sports Spectacular. But few games were re-imagined as many times as Baby T-Rex, and with so few changes. Nearly every aspect of the four games, from the music to the enemies to the gameplay, is identical. Even the stories are largely the same. In some cases, not even a word of dialogue was altered. When the dialogue is tweaked, it doesn’t do much to change the tone of the scene. Baby T-Rex — and all of the games that came out of it — was developed by Beam Software, an Australian studio with a surprisingly distinguished pedigree. In 1982, their text adventure version of The Hobbit reportedly sold more than a million copies. In the years to come, they worked on a number of console classics, including Shadowrun and The Lost Vikings II. Usually, re-skins and re-designs aren’t the fault of the original developer, but that isn’t the case for Beam Software. All four versions of the game were released by their own publishing company, Laser Beam Entertainment. The responsibility lies with them and them alone. Modern-day gamers might frown on their actions, but Beam Software’s intentions were probably pretty pure. All four games were released in different regions, and every game but Baby T-Rex features licensed characters. Agro Soar was the puppet host of an Australian children’s show. Bamse is the star of a beloved Swedish comic strip. They weren’t trying to re-sell the same game to unsuspecting children; they were trying to make their title more appealing to buyers in that region. If the Internet hadn’t evolved beyond AOL discs and Geocities pages, it’s likely that all this would have gone unnoticed. Amusingly, Beam Software managed to get yet another game out of Baby T-Rex. A fifth title, based on BBC puppet Edd the Duck, was developed and slated for release. It was even reviewed in the August 1993 issue of Game Zone. But, for reasons that have been lost to time, the game never made it to shelves. Baby T-Rex is not a remarkable game. It’s perfectly competent platformer, but it was released in an age of countless competent platformers. Unlike Kirby’s Dreamland or Super Mario Land, it hasn’t stood the test of time. Still, it’s impressive to see how much mileage Beam Software got out of one mediocre title. Baby T-Rex change the gaming landscape, but it did manage to reach gamers all across the globe. Unlike many games of its ilk, Baby T-Rex won’t be forgotten.